The town was first mentioned as Ded in documents dating back to 1360; however, later archaeological data proved that the city had already been known to exist in the Neolitical Age, and expanding during the next historical periods (the Bronze Age, the Iron Age, the Dacian-Roman period until the migration of the ancient people). In administrative documents from 1411 and 1427, the city is referred to as Ded or Dedul Mic. The name will no longer be used during the Turkish occupation. In the wars against the Turks, the inhabitants of the region took shelter in the forests and valleys of nearby mountains. The name Ded, or Dedul Mic, changed to Deta in 1724, when the colonization of Banat began. According to some historical researchers, during the Roman occupation the city might had been mentioned as Malva, a Roman colony, which is synonymous to the word town. Deta became a prosperous agricultural town, focusing mostly on breeding, trade and craftsmanship. Due to this growth, the locality was awarded the statute of township in 1810, by Emperor Francisc the First of Austria. It held this statute until the late 19th century. After the completion of the national Union on 1st December 1918, Deta too entered a new phase of extensive economical development. This led to a significant increase of the mass of population. An eloquent development was also registered in the realm of education, culture and sports, as a consequence of a later administrative distribution of the Romanian territory. In 1968, Deta was awarded the status of township for the 3rd time. The city of Deta is a small administrative, economical and cultural centre, situated in the South of Timis County, between Timisoara and the Serbian border. There is a 43km distance between Timisoara and Deta. The locality lays along the bank of Birdeanca brook, at the edge of the steppe and the forest. It represents the convergence of many local roads, but also marks the junction of two important highways, namely E70, the highway that connects the county’s capital to the customs on the border with Serbia, and the highway that makes the connection between the Torontal’s Plain and the mountains in Caras. The city is crossed by the railway that connects Timisoara to Belgrad. Deta is situated at 45° 23’ North latitude and 21° 12’ East longitude and 91m above the sea level. The administrative territory also includes the village Opatita, 4km East from the city. The plain is the prevalent form of relief, auspicious for agriculture. There is a continental climate, with Mediterranean influences. Winters are cool, summers are warm and long, while spring and autumn do not last long. The locality is surrounded by flourishing vegetation, but also steppe. Forests are characteristic for low plain regions. Rodent animals are representative for the fauna of the region. There are lots of rabbits, but also foxes, wild boars, deer and roes. As for birds, there are pheasants, kites, skylarks, starlings, wild geese and ducks. 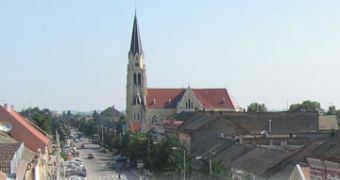 As for any other city that is situated in the South-West part of Romania, the agriculture plays an important role in the economy of this town. There were many changes related to property after 1989 and all had consequences on the agricultural estate of the city. The methods of working the land and also its surface had varied during the latter period, from small estates of about 1-5ha, to larger ones, of 200-300ha. At present, there are four legal associations, five family associations and 556 land owners who work the land by themselves or are members of the upper-mentioned associations. As concerning the variety of crops, there is a predilection for farming wheat, barley, maize and sunflower. There are also stray crops of oat and sugar beet. Industry is the branch the majority of the working population is involved in. Approximately 3000 people work in the companies mentioned below. In the perimeter of the city there are 17 small and medium companies. The most representative are: BELCAR, NIADAL ABATEX, RO-LAS-NEM (within the food industry), ESSEGY TEX (fabrics). A special attention deserves S.C. EYBEL SRL, a medium fabrics company, which was founded in 1999. Today, EBYL has 2000 employees, has provided outfits for over 3000000 cars and is one of the most advanced factories in Eastern Europe. In Deta there is also an important wood processing company, PLAPAF S.A., which is currently retooling under its new Italian ownership. The capital of all the small and medium companies in our city is entirely private or stock. There are 139 functioning companies, of which four are constituted with stock capital, three are corporate companies, 103 LLCs and SNCs. 92 companies are commercial companies, 41 utilitaries and 18 production companies. Deta owns a network of natural unassociated well gas, which spreads over the entire territory of the city. Both the companies and the private properties are connected to it. Located in the Northern half of Deta is a thermal bath which many residents use to heal their aches and pains. The pool is made up of two sections, one for children and a warmer deeper one for adults. A lap and a swimming pool are also offered in the Southern part of the town. A two-star hotel called Bellavista is located in the center and offers accommodation for 50 people, a fine dinning restaurant, dance club, exercise room and tennis courts for guests. There is a natural park, a successor of the ancient forest, which gathers oaks, linden trees, and acacias. Some of the oaks, several thousands years old, remained untouched in the park. The park offers numerous walking paths for visitors, as well as several pubs within its area. Deta has 6418 inhabitants, 69,49% of them have Romanian nationality, 16,44% Hungarian, 5,54 % German, 4,34% Serbian, 3,44% Gypsy and 0,75 % others. Deta has two important schools, Saint Nicholas High school and a primary school, with a total of 1400 pupils studying. The city’s hospital has four surgery rooms and 70 beds, a polyclinic with eight surgery rooms and a medical lab. There are also four private physicians and three pharmacies. Various cultural activities are taking place at the town cultural institute, at the reunion house or the public library. A new museum now resides in the center of Deta with a multitude of historical items dating back to medieval period, including weapons, ancient machineries, photos and other items of interest. Sport games are played in the schoolyards and in the new sports centre, built within the city park, which includes an indoor football field and an athletic multifunctional field: tennis lawn, volley-ball, basket-ball field and a swimming pool of Olympic size. Deta also has a football stadium where FC-Deta, a fourth division football team plays their games. Both the Orthodox Chapel, on Mihai Eminescu Street and the Catholic Church House, on Victoriei Street, give shelter for the spiritual life of the community. The latter is situated in the centre of the town and celebrated 200 years since its building. It was renovated with the support of private foreign donation funds. An Orthodox Cathedral is being built with governmental funds and private donations, which could still be made at parish’s accounts. Different worships are represented here: Serbian-Orthodoxism, Baptism, Penticostal.